I didn’t know what Dorset Buttons were until this very challenge was given to me by a fellow crafter. I spent about half an hour down a Pinterest rabbit hole and when I came out, I just wanted to know where to get my hands on some rings so I could get started! 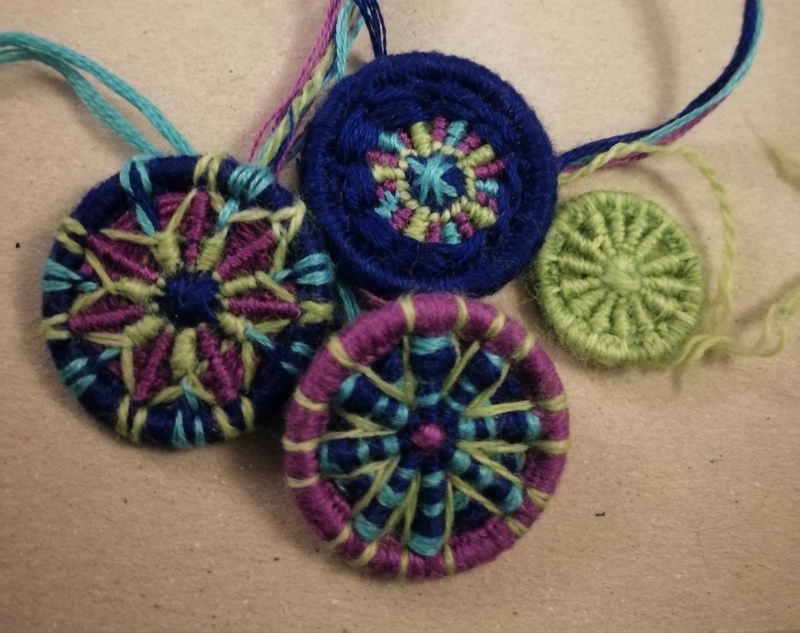 A quick internet order and a few days later, armed with a basic tutorial and the tiny ring and thread sample that was included in my order of 50 metal rings, I proceeded to do the simple steps to make a single-coloured Dorset Button. Blanket Stitch around the rim of the ring, pushing the stitches close together to avoid gaps. Wiggle this line of stitching until the top of the stitches are in the middle of the ring instead of around the outside. Wrap the thread around the ring several times, down to 6 o-clock on the back, up to 12 o-clock on the front, rotate a little, repeat, etc until there are spokes. Cross-stitch to adjust the centre and make the rear spokes align more or less with the front ones. Bring the thread up between two spokes, back down again one spoke clockwise, up again two spokes anti-clockwise, down again one spoke clockwise etc… (I call it back stitching) and keep going round and round until your spokes are covered. There are more details involved, caveats etc, but I’m no expert. I am finding my own way on this journey with the exception of the basics, provided on the website where I bought my supplies. Wherever you are in the world, just search Dorset Buttons and you should find a retailer that will sell you some kits or just the metal (or plastic) rings you need. This one is different: I actually stitched into the original blanket stitches instead of wrapping the thread. The rim and stems are made with No. 10 crochet thread. The French knots are made with embroidery cotton. I soon realised that my 24mm metal rings were a nice size, but if I wanted more details I would need to source some larger ones, so I am now the proud owner of 20 each of a couple of larger sizes of hollow brass rings from the same place. 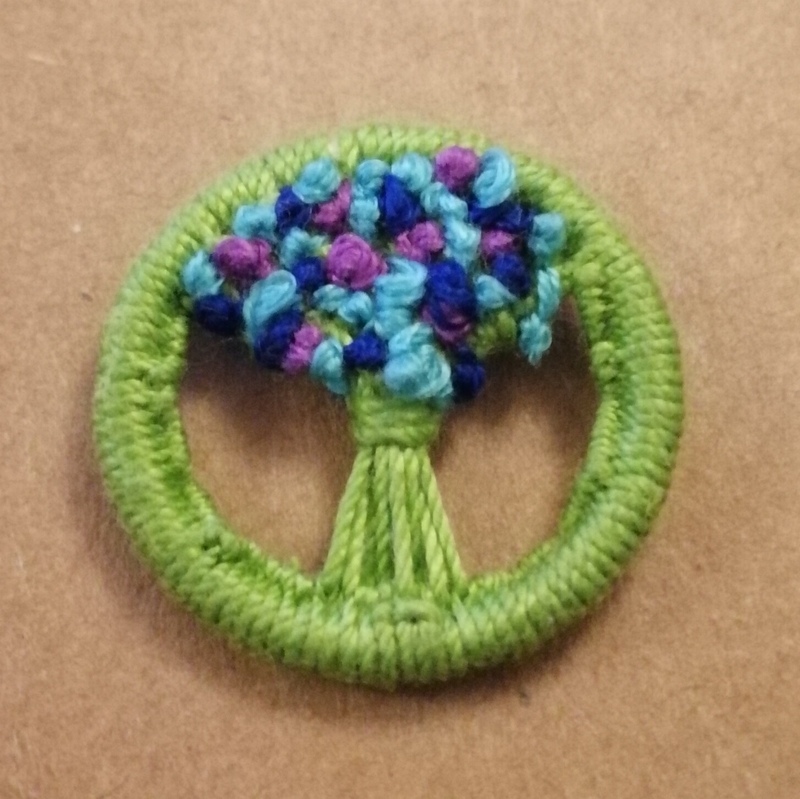 Along with it came another teeny ring and sample of thread, so I have some experiments to do. Why not check it out for yourself? Dorset Buttons. The challenge stands.